The US electoral system is actually quite complex but we will try to make it as simple as possible. In a nutshell any administration wants a backing from Congress to govern in a smooth way. Republicans enjoyed such situation for the past 2 years, lacking only supermajority in Senate (so they had to consider Democratic opposition on some issues). No more. They have just lost the House of Representatives – the key legislative body. Increasing their number of seats in the Senate or winning more governors is nearly meaningless in this context. Furthermore, even though these elections were for the Congress, they were about Trump. Higher turnover and a strong result for Democrats means a tough campaign for Trump ahead of his 2020 elections. Isn’t it too good to be true? We are looking at a textbook double bottom formation on the EURUSD with a round 1.13 level as a support. Could the pair be out of the woods already? Some traders may consider a tougher political landscape as negative for the USD but remember that the euro still has unresolved issues: Italy and Brexit. Either way the key resistance for the pair seems to be at around 1.1625. This pair is especially worth watching as it combines weakness (USD after Midterms) with strength (NZD). The New Zealand’s dollar was already benefiting from risk-on appetite when it got a tremendous boost from the quarterly labour market report. It turned out that not only employment surged by 1.1% q/q but the unemployment rate tumbled from 4.5 to 3.9%. Keep in mind that the NZD was depressed as the central bank started to talk about cutting interest rates. Now this may no longer be the case. Technically the pair has recovered towards the key resistance zone starting at 0.6785. Breaking it would open a major room as the pair would return to a previous (very broad) consolidation channel. Equities are perhaps the most puzzling as Republican Congress would allow administration to pour some extra fuel on the economy (think tax cuts for the middle class or the infrastructure deal) and now this possibility is gone. 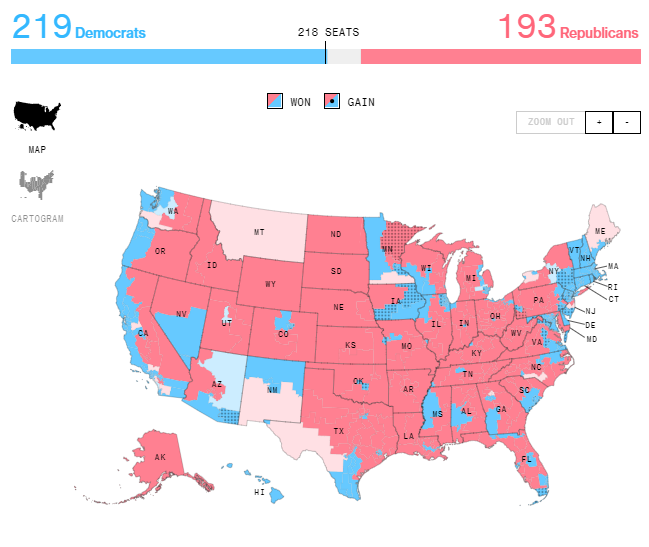 It looks a bit as if investors were thinking they got what they wanted from Trump (tax cuts) and now they want him out in 2020 and this result makes this more likely. However bear in mind that Trump could stiffen his stance on trade and geopolitical issues in a response so it remains to be seen if this honeymoon for stocks is about to last. Looking at the chart we can see that a similarly rapid recovery took place after the first “leg” of correction in February but then we had another sell-off towards the end of March.